Pearls strung on silk bead cord are strung one at a time, then a knot is tied in the bead cord between each individual pearl. In traditional pearl bead stringing, pearls are strung on silk bead cord. This is still true today for any type of high end pearl necklace, and there are a couple of reasons why. One reason is that both pearls and silk are natural in origin, and therefore complement each other, and also both have a value to them. Silk also picks up the soft sheen of the pearl luster, and makes a necklace made this way flow in style and look. However, the main reason that pearl necklaces are strung on silk bead cord is because of safety. Pearls strung on silk bead cord are strung one at a time, then a knot is tied in the bead cord between each individual pearl. Necklaces and bracelets strung this way most often also have a safety clasp, and might also include a safety chain too. These are all ways of preserving the pearls if the necklace should be broken at any point along the strand. With each pearl knotted in place, if the necklace were to break, you would only lose one pearl. And in a situation where the pearls are expensive high end pearls, this is of vital importance. A loss would much more devastating if you lost several or all the pearls in a necklace instead of just one. In addition to safety, pearl knotting is a very elegant and delicate looking bead stringing technique. It is much more time consuming than regular beading, because tying a knot between each pearl is tedious and slow, however, the result is an additional element added to the design of the necklace, the cord itself, because the knots do show between each bead. While you can buy silk bead cord in bulk, and needles in bulk, the easiest way for anyone to use silk bead cord is to buy the single packs of bead cord shown here. 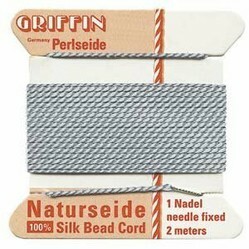 Griffin is the most well known bead cord maker, and they carry a very large selection of both sizes and colors. Each single pack comes with the flexible wire needle already connected to the bead cord, so that it is ready for use. No worries about threading the needle yourself, which can be extremely difficult. The most common color is white or off white to match pearl colors, but I usually like to use contrasting colors instead. Just like the size of beads, bead cord comes in a measurement of the diameter of the cord (cross section), but you also need to consider the length of the cord in the pack. Most beaders that use Griffin silk bead cord use either #3 or #4 for stringing pearls. You can use the bead cord for many other beading uses that include bead weaving, sewing, or embroidering to name a few. When deciding the length of your cord, you need to remember that you will use between two to three times as much as you would in regular bead stringing. The knots take up a lot of the bead cord. 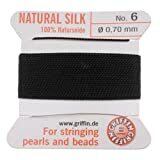 Griffin calls their silk bead cord Naturseide, and they also have a synthetic Polymid Nylon Bead Cord which is also a very good product. The Polymid is actually stronger than the Naturseide but you lose the traditional inclusion of silk. Both types are available from Amazon at a very good price, and you can try it out with just one pack or buy it in bulk to get better pricing.